Constitution Hall is a finalist for the 8 Wonders of Kansas because the events that transpired inside the walls of this two-story, wood-frame building were, without a doubt, major events leading to the American Civil War! Constitution Hall, in the small but historic community of Lecompton, has stood for more than 150 years, since 1856, as a testament to the Herculean struggle America waged to break the shackles of American slavery. Drafting the proslavery Lecompton Constitution in 1857 in Constitution Hall was one of the major dominos to fall leading this country into four years of unimaginable civil war carnage. 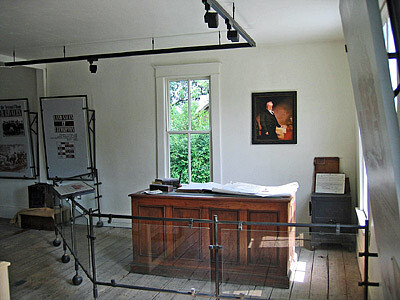 In terms of historical importance, the Lecompton Constitution ranks up there in the pre-civil war historical pantheon of events such as Uncle Tom's Cabin, the Compromise of 1850, the Kansas-Nebraska Act, the Lincoln-Douglas Debates, the Dred Scott Decision, Harpers Ferry, and Lincoln's election. 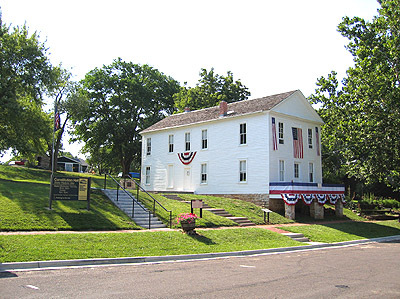 Lecompton Constitutional Convention delegates struggled from September to November 1857 to hammer out a constitution acceptable to both North and South. The stakes were high for Kansas and for the Union. 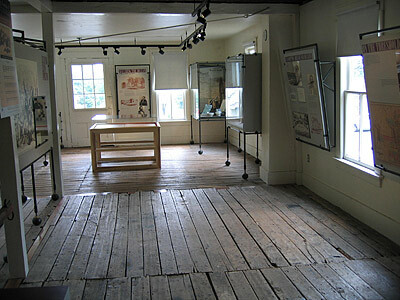 The North was determined to defeat the pro-slavery Lecompton Constitution and stop the expansion of the peculiar institution of slavery into Kansas and beyond, and the South was as equally determined to make Kansas the next slave state in the Union, or secede from the Union if they failed. The Lecompton Constitution ignited a firestorm in the country: it paralyzed Congress, rendered President Buchanan impotent, splintered the National Democratic Party into antislavery northern and proslavery southern wings, and guaranteed massive losses for the ruling Democratic Party in the next election including the White House, catapulted an obscure Illinois politician named Abraham Lincoln and the new Republican Party onto the national political stage and Lincoln into the White House as the first Republican president, and pushed the country ever closer to open warfare. Civil War historians and history buffs alike from all over the world make the pilgrimage to Lecompton to visit Constitution Hall. Hours and admission charge: March-November, Wednesday-Saturday 9 a.m.-5 p.m.; Sunday 1-5 p.m. $3 adults, $1 students. Children under 5 free.